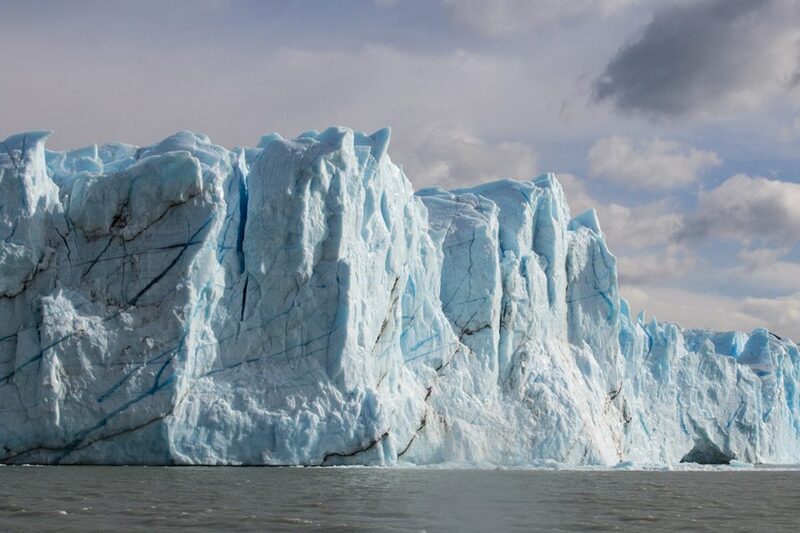 After our adventure tours of the world’s greatest ice flows in Antarctica and Tierra del Fuego, our latest destination is the superstar of Patagonian ice, the spectacular Perito Moreno Glacier. 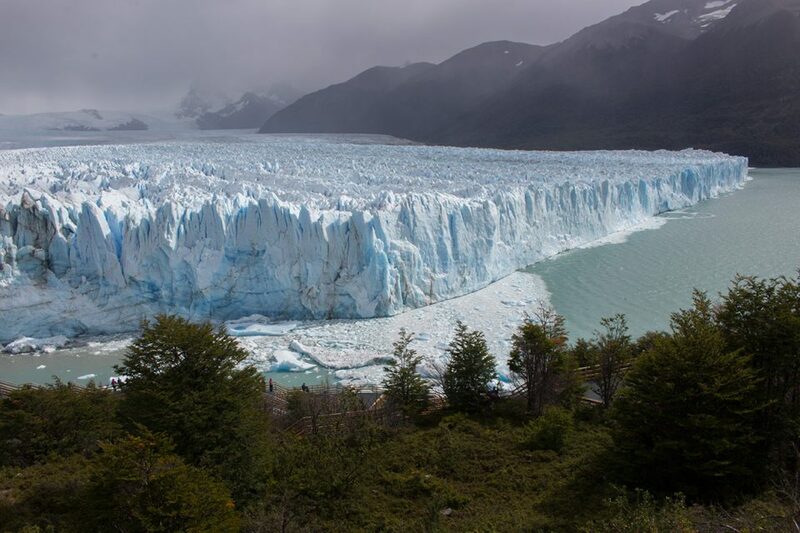 Located in the southern reaches of Argentina’s Los Glaciares National Park, the Perito Moreno Glacier is famous for its very active calving; and even better, visitors can get up-close and personal with all the action. And while the Perito Moreno Glacier might steal the spotlight, there are several other up-and-coming starlet glaciers that will literally take your breath away. 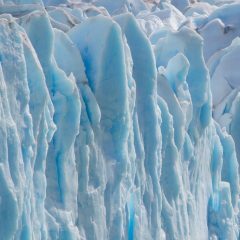 Most travelers and ice adventurers base themselves in the small town of El Calafate, 80 km east of Los Glaciares National Park. While the artisanal chocolate and ice cream shops along the town’s main drag are a definite plus, it’s really the natural setting on the shores of Lake Argentino which makes El Calafate stand out. The beautiful grey-green lake is Argentina’s biggest body of water and is thought to be the remnants of a once vast glacial system that covered the entire region. El Calafate is the gateway town for visiting Parque Nacional Los Glaciares. El Calafate has an airport with direct flights to and from Buenos Aires, Cordoba, Ushuaia, and Bariloche, among others. Flights also connect to many international destinations such as Chile, Uruguay, and Brazil. El Calafate can also be reached by bus from various nearby (or not so nearby) cities. A bus trip from El Chalten takes about three hours. We went with Chalten Travel and were quite happy with their service. Trips from Bariloche take 24 hours and from Puerto Natales in Chile (Torres del Paine National Park) six hours. 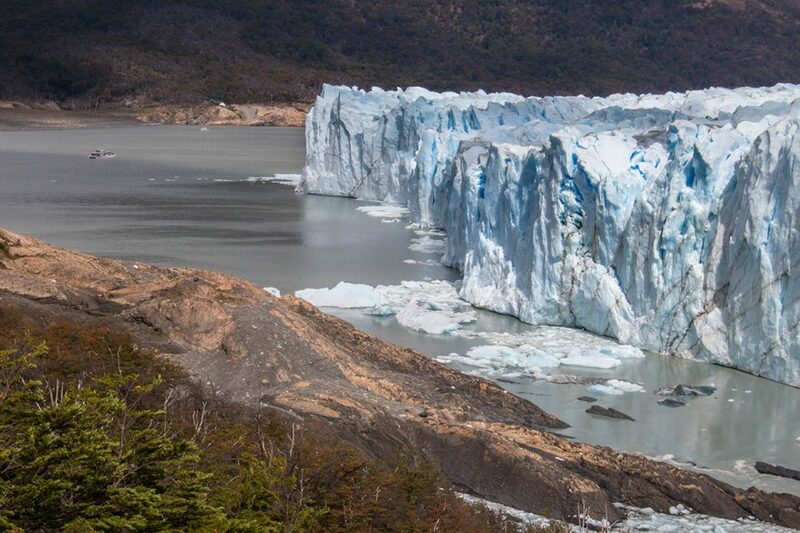 It’s quite easy to visit the Perito Moreno glacier from El Calafate. You can rent a car and follow your dream of a Patagonia road trip. Just drive along the scenic route RP 11 from El Calafate all the way to Los Glaciares National Park. You can also take a taxi, but unless you travel in a bigger group, it wouldn’t make much economic sense. 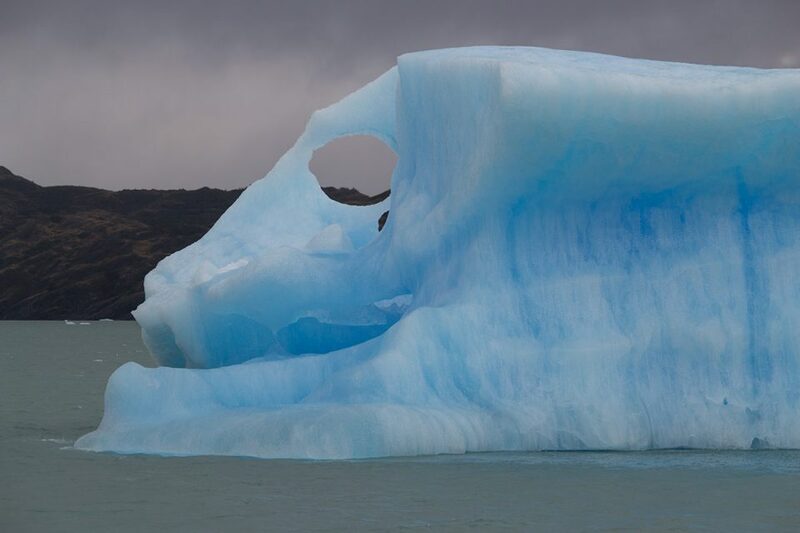 Instead, for ease and comfort, you can take one of the many glacier tours being offered in El Calafate; just check around locally the day before you want to visit or book online in advance (see more on tours below in our “Plan your Trip” section). If you want to go to the Perito Moreno Glacier independently and keep costs down, your best option is to take a shuttle bus, which we did. It’s best to confirm departure times and availability the day before. Head to the main bus terminal in town. There are different bus companies covering the stretch between El Calafate and the Perito Moreno Glacier (check for destination: Glaciar Perito Moreno). They all leave at slightly different times, between 7:30 AM and 9:30 AM. Often, there is also an afternoon departure around 1 PM. Morning departures return from Los Glaciares National Park at around 4 PM, and afternoon departures return around 7:30 PM. We went with CalTur at 9 AM. The trip takes about 90 minutes, and the return trip costs around 500 Argentine pesos, depending on what company you go with. Upon entering Los Glaciares National Park, you have to pay an entry fee of 500 pesos (as of January 2018). The bus stops at Puerto Bajo de las Sombras to let off passengers who want to take a catamaran tour to the glacier face. 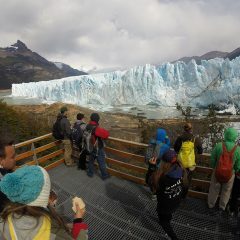 Afterwards, they are picked up again and driven to the actual walkways opposite Perito Moreno Glacier. Buses back to El Calafate return from there. On the hour-long ride from El Calafate to the Perito Moreno Glacier, you can still see the remains of that glacial past as the bus winds though jagged peaks and U-shaped valleys carved out by waves of rock and ice. If you let your eyes wander over the Patagonian steppe, you may even spot some of the region’s spectacular wildlife. With a little luck, you’ll encounter small flocks of Chilean flamingos, lonesome grey foxes and large numbers of caracaras. We were so focused on these spectacular birds of prey that we almost missed the choiques, ostrich-like flightless birds, standing in the yellow broom sedge by the side of the road. As we entered Los Glaciares National Park and made our way onto Magallanes Peninsula, the landscape slowly changed. The dry yellow steppe of the UNESCO World Heritage Site gave way to lush green lenga forest. The steep winding road down to the famous glacier allowed first glimpses of the blue ice wall that lay beyond. Everyone on the bus began to ooh and aah as smart phones, iPads and cameras flew up all around us to capture the fleeting moment. (Not ours, we knew better than photographing out of a moving bus). The Perito Moreno Glacier, like dozens of other glaciers in the area, is fed by the massive Southern Patagonian Ice Field. 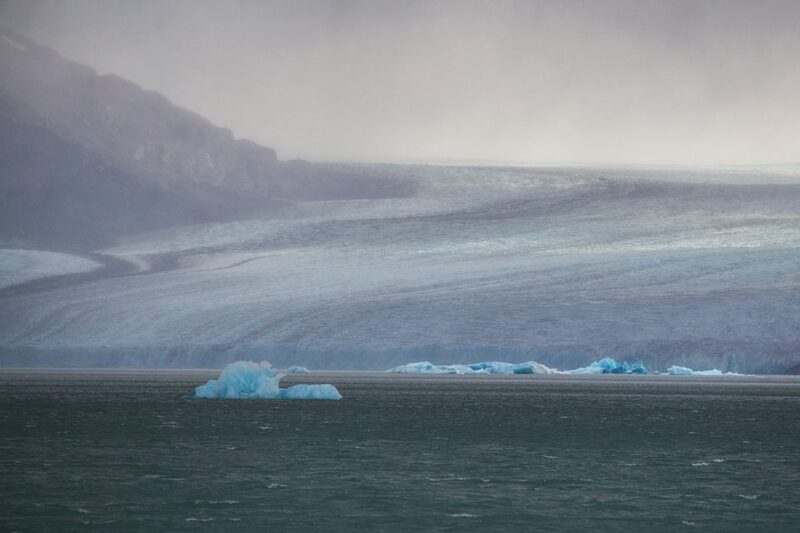 It’s not just the scale of the glacier that makes it so unique but also the fact that the ice advances about two meters a day, which results in a phenomenal amount of calving action. It’s a rare and conveniently predictable spectacle which draws in the crowds who literally stand there applauding nature. This is one of those rare natural locations on earth, kind of like Old Faithful in Yellowstone, that works well with scheduled tour groups. Larger than life, the towering glacier loomed 60 meters above the water before our very eyes. As we approached the five-kilometer wide face, it sparkled beautifully in the sun. Suddenly, clouds swept in, and the color of the ice completely transformed from bright white to deep blue. One minute there was sun, then clouds, then sun again, then drizzle followed by rainbows – actually, the perfect weather for glacier-watching. With each change of light, new subtle facets in the ice were revealed, and the crowd around us pushed in even closer to capture it all on film. After the catamaran tour, we made our way to the system of connected platforms and walkways constructed on the forested slope just opposite the glacier. It’s an impressive structure which might even justify the hefty entry fee. The four-kilometer long catwalk zigzags up and down the side of the hill close enough to the ice to see and hear all the action but far enough to stay relatively safe. (However, if there is an especially big calving, hit the deck because flying ice has, on occasion, killed people.) The extensive network of paths and platforms allows crowds to easily disperse and left us room to breath. Aahhh. At times, as we weaved in and out of the magical lenga forest, we couldn’t see the blue glacier ice through the foliage, but we could hear it. Creeeek! A loud splitting sound behind the trees signaled something good to come; you could hear a developing fracture moving through the wall of ice. Driven by adrenaline, Tony and I started running along the walkway to find an unobstructed view. When we found a gap in the trees… a crystal fall of white powder and shards of blue ice tumbled into the water and sent concentric ripples in every direction. The experience was almost hypnotic and absolutely addictive. We kept walking and hoping for an even bigger spectacle. In the end, we were quite lucky. Within a few hours, we saw several large icebergs calve, the biggest shortly before we left the park. 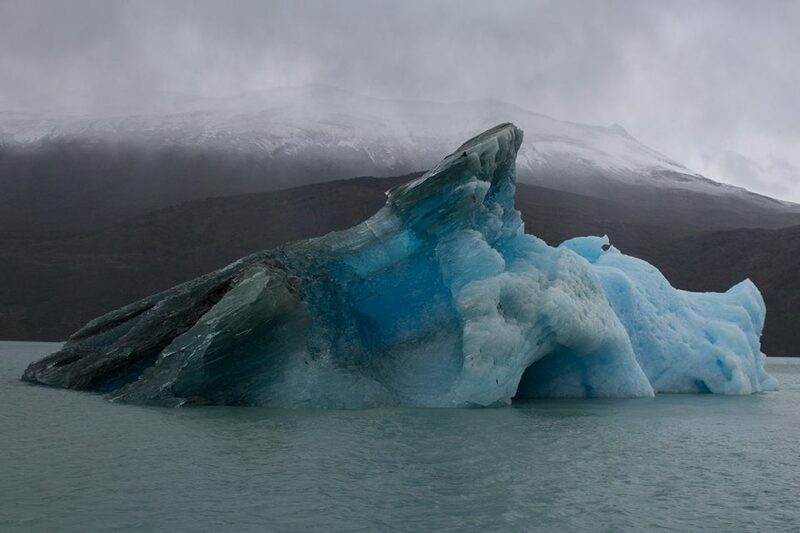 The 40-meter high ice giant collapsed as if in slow motion and elegantly slid into the grey waters below. Everyone watching held their breath. It took several seconds before the iceberg reappeared at the surface and started rolling in the water to find its balance. After a couple of minutes, everything was calm again and the berg simply drifted away. Absolutely stunning! As I mentioned above, the Perito Moreno Glacier is not the only shining star in the southern region of Los Glaciares National Park. 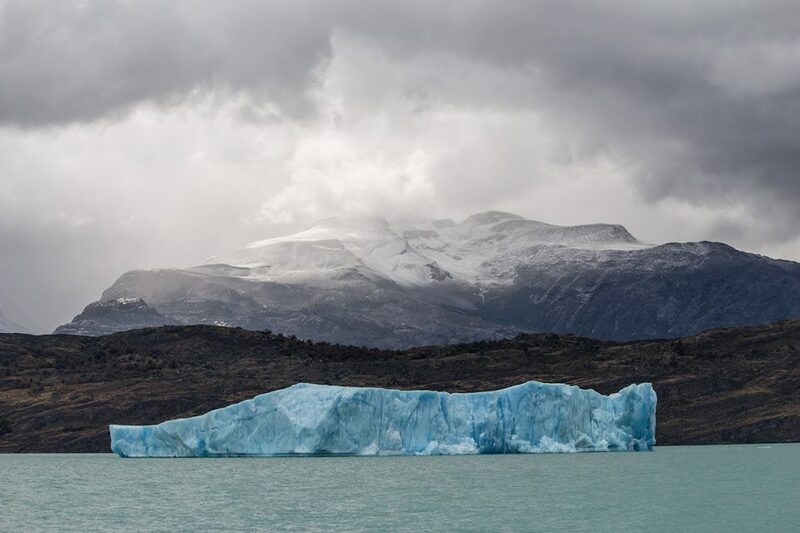 Travel by boat along the northern arm of Lake Argentino, and you’ll discover the lesser known but up-and-coming starlet glaciers Upsala and Spegazzini. 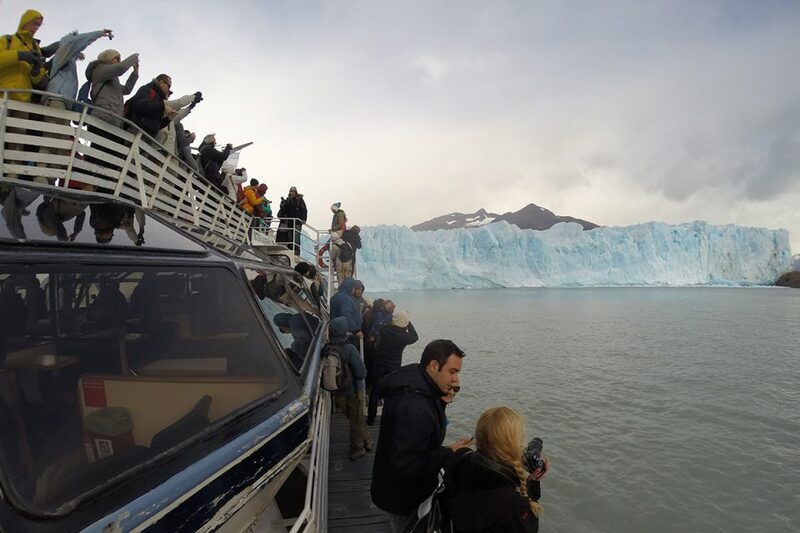 Both glaciers are only accessible by water, and visitors need to choose one of many cruise operators in El Calafate to make the return trip. Blessed with an unshakeable tolerance of anything ice, Tony and I signed up for the full-day “Glaciers Gourmet” cruise with Cruceros MarPatag. This luxury cruise operator promises small group sizes and, more importantly, a gourmet lunch while cruising along the face of the Spegazzini Glacier. Epic glaciers and delicious food? Obviously, I didn’t need any convincing. As our small group of eight made their way to MarPatag’s private port La Soledad 50 kilometers outside of El Calafate, our guide Mariano introduced himself and gave us a quick weather update: sun, clouds, wind and rain – not surprisingly, the whole Patagonia package. We boarded the cruise ship Leal with its dark wooden interior and were seated with a family of three from New York. This was quite a different experience from our crowded Perito Moreno Glacier cruise. Shortly after we left the pier, coffee and cookies were served to hold us over until lunch while Mariano gave a presentation on the formation of the glaciers to come. 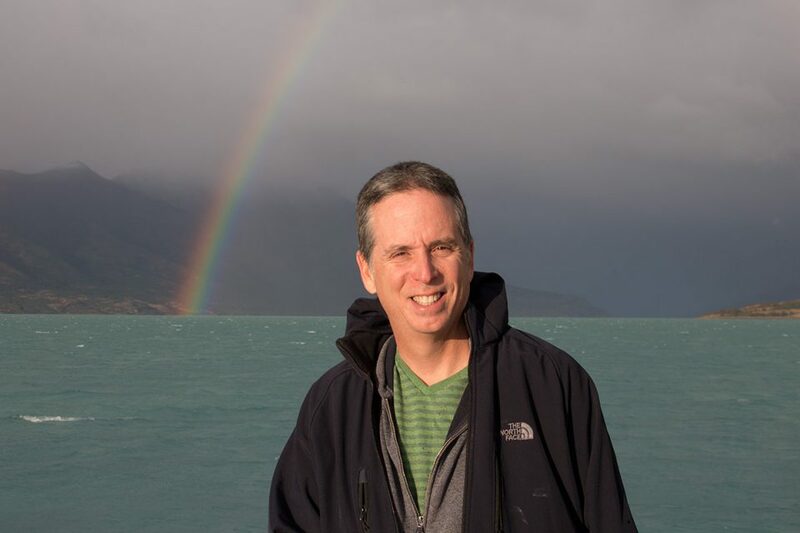 Just as we made our way through Boca del Diablo, the narrowest passage on Lake Argentina, a brilliant rainbow appeared over the turquoise waters of Brazo Norte, a narrow arm of the lake that leads into the mountains. We immediately took the party outside. Low clouds moved in and out, but whenever the fog lifted, we gasped at the view. Vibrant blue icebergs floated by against the beautiful orange and rust-red foliage of Nothofagus trees along the shores. Beyond the clouds and mist, you could see the dark snow-capped outlines of the surrounding peaks. Our “encounter” with the Upsala Glacier was short and somewhat underwhelming. If our guide hadn’t pointed out the grey foggy massive in the distance, I might have missed it altogether. 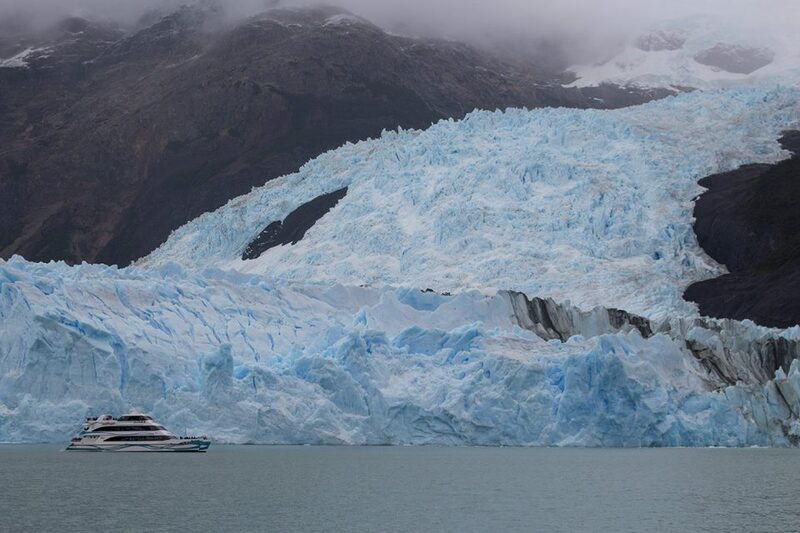 Mariano explained that all cruise ships had to stay 6 kilometers from the glacier face for safety reasons. Active calving, giant ice floes and tidal waves are obviously not to be taken lightly here. After several months in the southern hemisphere, Tony and I have become experienced glacier-adventurers and know of the associated dangers, so when we turned away from the Upsala Glacier and headed up the Spegazzini Channel, we weren’t quite as disappointed as some of the other passengers on board. The real attraction here was the opportunity to weave in and out of the icebergs along the way. For many people, this trip will probably be their one and only opportunity in life to dodge the ice. By now, my stomach had started growling, and I was wondering about MarPatag’s gourmet lunch. Just in time, the waiter set down a starter platter of ham, prosciutto, two different cheeses, olives, tomatoes, and mushrooms. With it came a basket of bread and a selection of drinks. Yum! 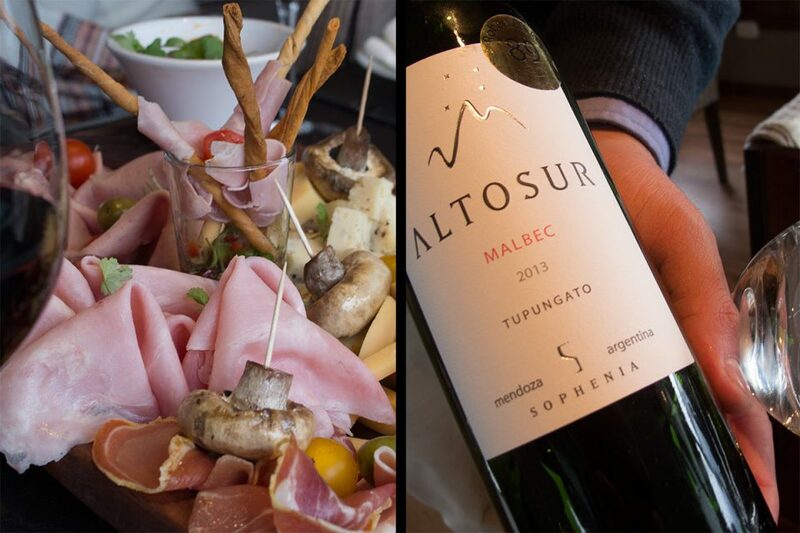 I’m a huge Malbec fan, so I went right for the Altosur Malbec from the famous Mendoza wine region. While we were munching and sipping and pressing our noses against the windows, an ominous black-and-blue iceberg came into view. Suddenly, the food became incidental. Everyone jumped up, grabbed their cameras and phones and ran outside. Even with only eight people on board, there was some friendly pushing and shoving. The Leal slowed down to give us extra time to really appreciate this extraordinary piece of natural art. The iceberg had flipped over exposing its glassy underbelly to us. Washed clean of snow and debris, we could clearly see its surface sculpted by the power of water and time. While in Antarctica, we had seen a million shapes, but never such a strikingly colorful floating jewel. This was obviously very special, and we were all asking ourselves where the iridescent black-and-blue iceberg had come from. The answer to that question came several minutes later when the ship positioned itself in front of the enormous Spegazzini Glacier. Nibbling on our empanadas, we gazed up at the 100-meter high glacial face with a unique vein of highly compressed black-and-blue ice. Everyone rushed out again to get a closer look. As clouds moved over the sun, a kaleidoscope of shifting colors danced across the jagged peaks and deep fissures of Spegazzini. Everyone on board stood in silent awe. The spectacle was followed by lamb stew and a delicious dessert of white chocolate mousse. Yum! There is honestly no better way to enjoy fabulous glacier views than from the privacy of your own cruise ship. 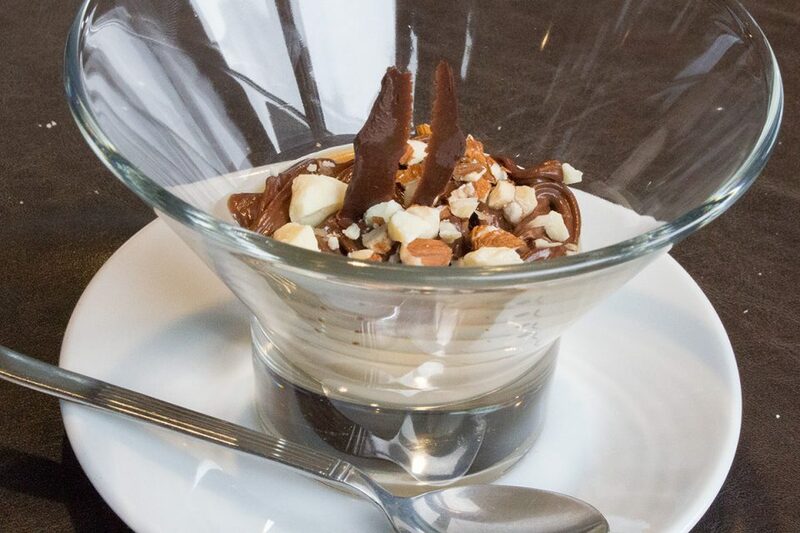 Add to that a delicious gourmet lunch, and you are in glacier heaven. As we headed back down the Spegazzini Channel, we disembarked at the quiet bay of Puesto de las Vacas for a short guided walk and a visit to a historical pioneer station. Beside the beauty of the landscape, it really was the thought of setting foot on such an isolated shore which made this little excursion quite unique. After exploring the old living quarters and contemplating what life must have been like in this remote part of the world, we boarded again and made our way down Brazo Norte back to Punta Bandera where we had started. 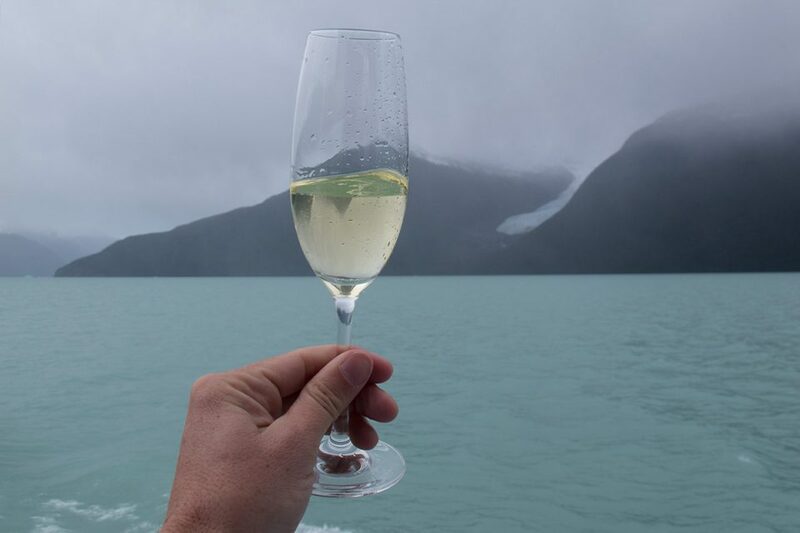 With a glass of champagne, we toasted to the phenomenal Upsala and Spegazzini glaciers as we cruised back through a towering wilderness of stone walls and waterfalls. For inquiries about MarPatag’s different cruise options including their 2-night “The Spirit of the Glaciers” cruise, visit them at www.crucerosmarpatag.com/. If you need more convincing, make sure to check out Tripadvisor’s fantastic reviews about MarPatag’s different cruises. When to Go – Best time to visit is October through March when days in Patagonia are warm and dry. But don’t shrug off the shoulder months September and April; the weather can be quite pleasant, and the park is usually less crowded. One special highlight in April (and into May) is the colorful bright-red fall foliage which stands in stark contrast to the blues and greens of this region. 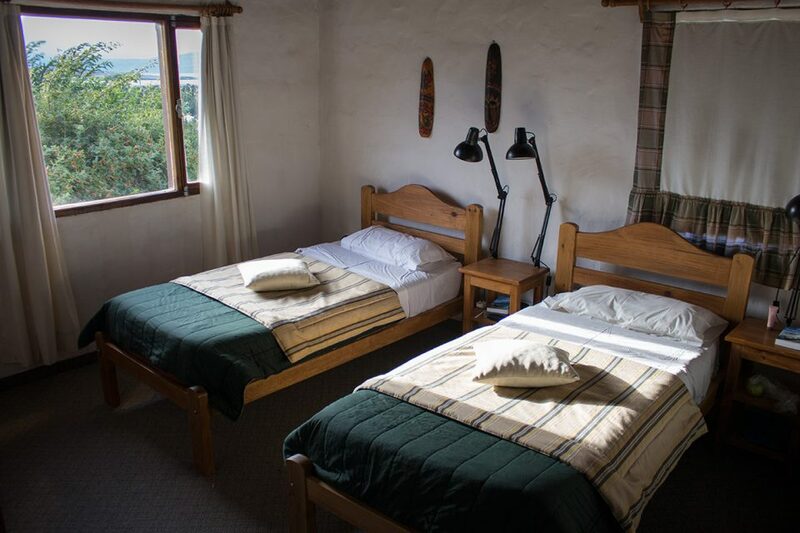 Accommodation – El Calafate is a comfortable town located on the shores of Lake Argentino. The town bursts to life in summer when glacier tourists and adventurers from around the world flock in. Prices during high season can be steep, so booking in advance is advised. We stayed in the lovely Hosteria Los Barrancos (read our review further down), but there are plenty of other options. We recommend searching for great El Calafate deals on HotelsCombined.com, a site which finds the best deals for you across numerous top hotel booking sites, including booking.com and agoda. 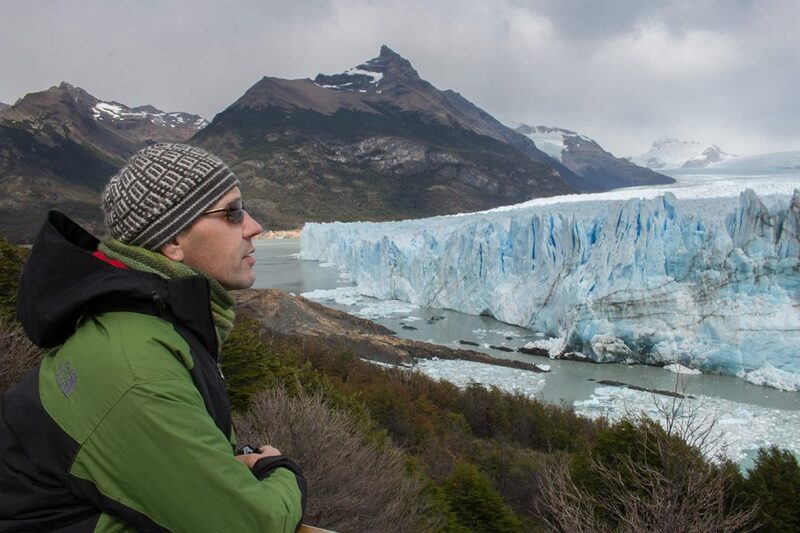 Tours – El Calafate, the gateway town to the Perito Moreno Glacier and Los Glaciares National Park South, is a great base for organizing adventure sports and tours into the surrounding area. The town is home to many tour companies. One such company is Hielo & Aventura, which runs the catamaran tour (Safari Náutico) to the Perito Moreno Glacier inside the national park. 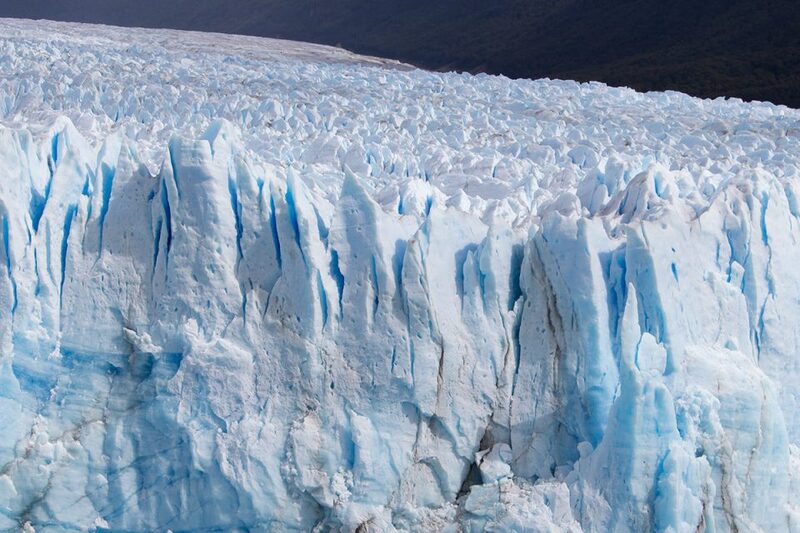 They also run popular Perito Moreno Glacier hiking tours (MiniTrekking and Big Ice). If you want to see the Upsala and Spegazzini glaciers, you need to take a cruise. We went with Marpatag’s full-day sailing cruise, which we can highly recommend. 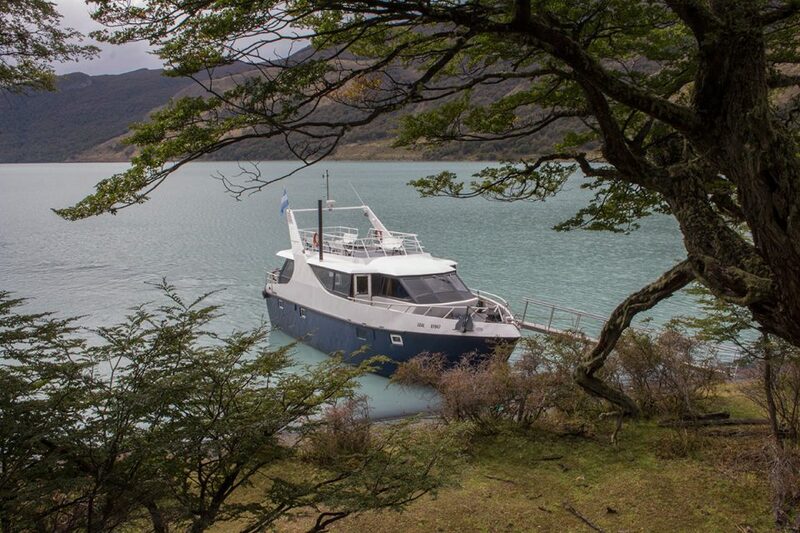 They also offer multi-day cruises on Lake Argentino. 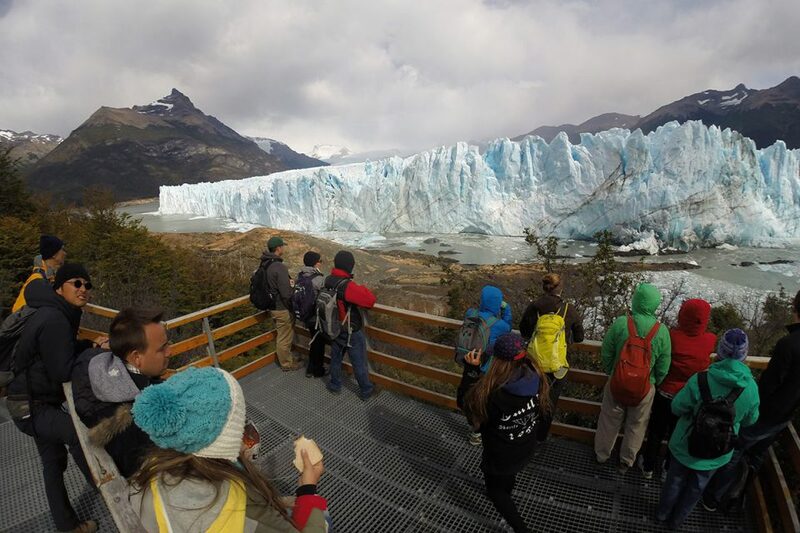 You can conveniently book all these tours on Viator including ice hiking on the Perito Moreno Glacier and Marpatag’s “Gourmet Glaciers” sailing cruise. REI also offers various 2-week Patagonia hiking trips that combine Los Glaciares National Park in Argentina with Torres del Paine National Park in Chile. Guidebooks – We normally travel with a Lonely Planet. During our travels in Argentina, we used the Lonely Planet Argentina . The guide is great for cultural and historical info, maps, hiking tours, itineraries, and includes highlights such as Los Glaciares National Park, Península Valdés and Punta Tombo, Mendoza, Esteros del Iberá, Tierra del Fuego, and even Torres del Paine National Park in Chile. 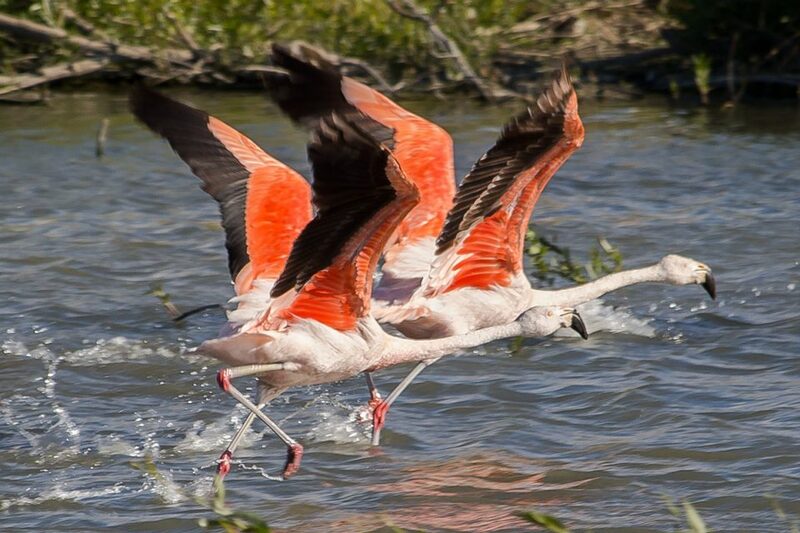 If you prefer a more visual guidebook, we recommend the DK Eyewitness Travel Argentina . These guidebooks can be conveniently purchased on Amazon. Travel Insurance – Overseas medical insurance is probably THE most important thing to have for nature enthusiasts and outdoor adventurers. WorldNomads’ travel insurance covers travelers for overseas medical, evacuation, baggage and a range of activities and adventure sports. You can buy and claim the insurance online, even after you’ve left home. Travel Gear – There’s a long packing list for Patagonia, especially if you want to include some hiking. To help you get started, here are a few essential things everyone should have: A good pair of hiking boots , a windbreaker , and trekking poles ; they will be one of your best investments for your knees and back. We also recommend an action camera such as the GoPro to capture your adventure on film. We would like to thank Hosteria Los Barrancos in El Calafate for hosting us while exploring Los Glaciares National Park for a few days. We especially want to thank the wonderful owner Anna for her warm welcome, great tips, and the invaluable information she provided upon our arrival. 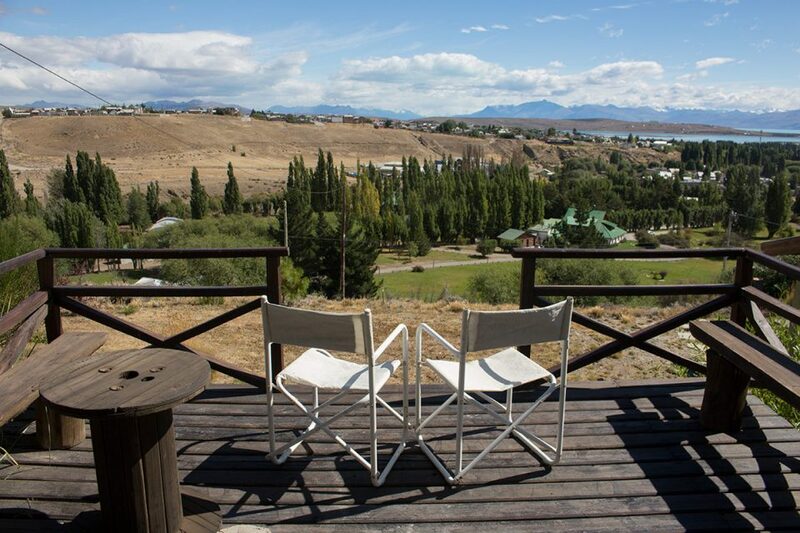 Hosteria Los Barrancos is located a 20-minute walk outside of El Calafate on a hillside overlooking the town. In addition to panoramic views, guests enjoy a great communal area, free WiFi, and homemade continental breakfasts. The vibe of Hosteria Los Barrancos is very reminiscent of a great ranch home somewhere in the American Southwest. Anna speaks Spanish, French and English, and she goes out of her way to ensure her guests have a really great visit. If you would like to find out more about Hosteria Los Barrancos, inquire about room rates or make reservations, visit www.hosterialosbarrancos.com/ or go directly to Hosteria Los Barrancos on booking.com. 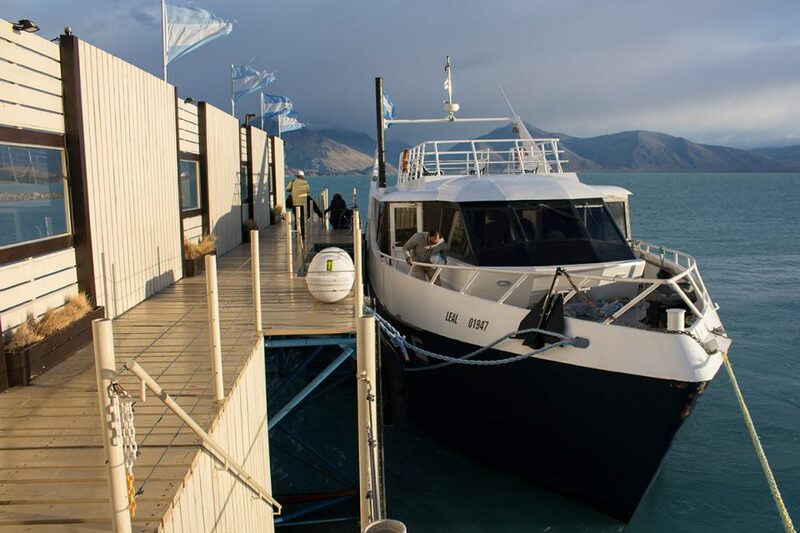 Disclosure: We were guests of Cruceros MarPatag as well as of Hosteria Los Barrancos during our visit to Los Glaciares National Park and our stay in El Calafate. However, all of the opinions expressed here are our own. In addition, the article contains links that help us earn a small commission at no extra cost to you. Thank you for your support! How much is the entry to the park? You make it sound quite expensive. @JarJar: At the time of writing, the entrance fee to the park was 215 Argentinian pesos which, according to the blue market rate, is about US $18. That was just the entry. We also paid 300 ARS (US $25) a person for the bus and another ARS 200 (US $16) for the one-hour boat tour on Brazo Rico. 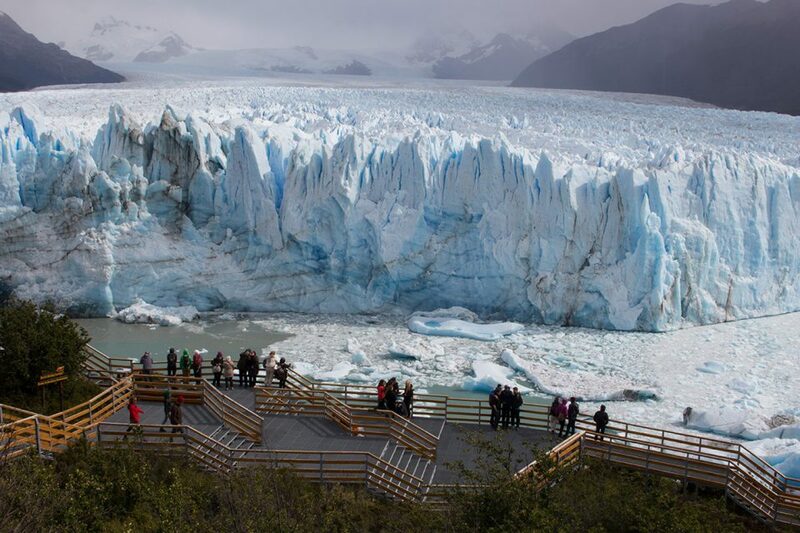 Without the boat tour, the minimum you’d have to pay for a visit to Perito Moreno is US $43. 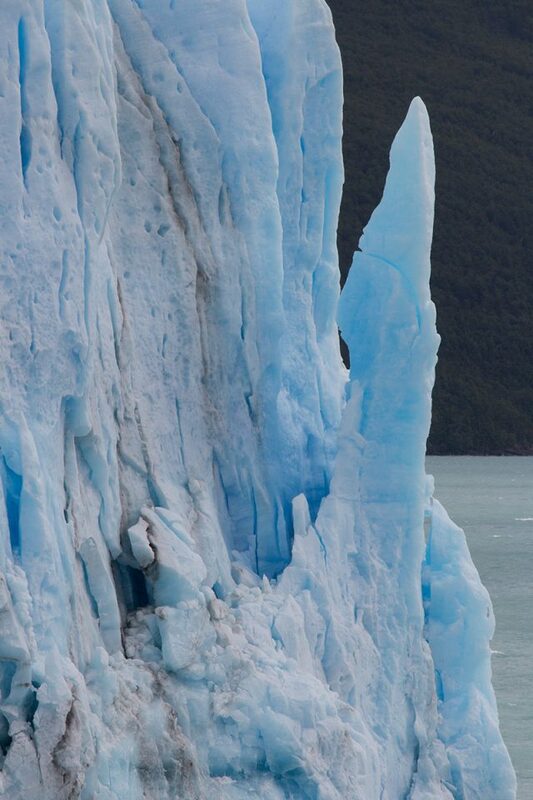 Perito Moreno is big on my list. Mann, das sieht toll aus, ich beneide euch!!! I’ve heard mixed reviews about Perito Moreno. My friend Jen was there last year and she said it was completely packed. Did you find the crowds to be overwhelming? 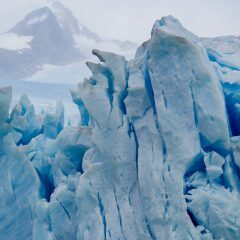 Would you recommend just visiting the less famous glaciers? We actually thought that Perito Moreno really lived up to its reputation. As Thomas mentioned, the famous walkways and platforms are positioned just opposite the glacier face, which gives visitors a really unique opportunity to get close to the glacier. 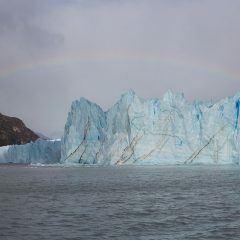 Visits to other glaciers are often done by boat, which means that you have to stay back a bit due to potential calving. It’s true that Perito Moreno can get crowded, but the way the site is designed allows visitors to spread out. 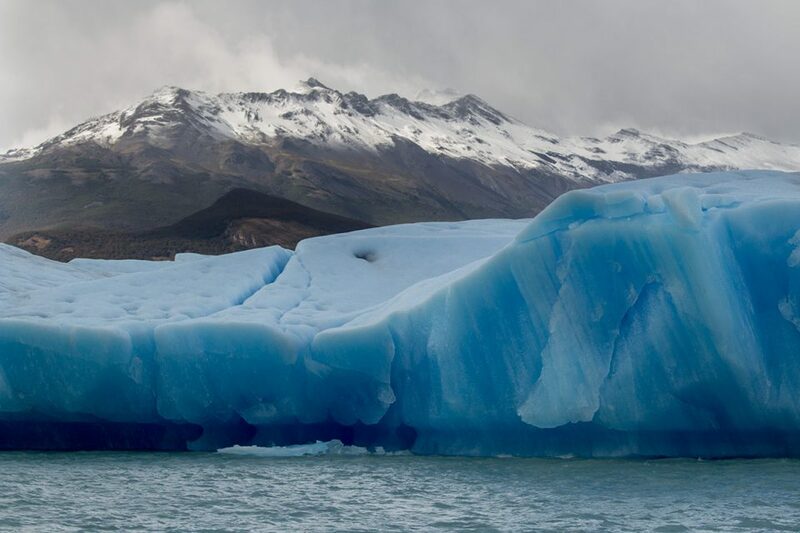 There are other glaciers in Patagonia where you can get up close, but most of those will cost much more to visit because they require special cruises/tours. @Georg, isn’t it amazing? We were as surprised as you – flamingos and glaciers all in the same area. Absolutely loved it! Very amazing pictures. Please tell me the entry fees of the park. @Veronica: At the time of writing, the entrance fee to the park was 215 Argentinian pesos which, according to the blue market rate, is about US $18. Nice blog you have wrote.